Howz that globalization workin' out fer ya? A new National Science Board report, Science and Engineering Indicators 2012, finally shows some bleak statistics for American Scientists and Engineers. High-technology manufacturing has lost 28% of jobs since a 2000 employment high of 2.5 million. That's 687,000 jobs. Below is the NSB report graph of the drop in high-tech manufacturing employment for the last decade. U.S. employment in high-technology manufacturing reached a peak in 2000, with 2.5 million jobs. 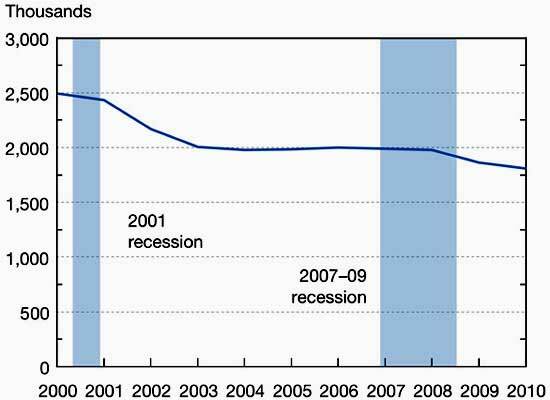 The recession of 2001 provided the first big hit causing “substantial and permanent” job losses, the report said. By the end of the decade, more than a quarter of the jobs were gone. The law of supply and demand still works! The National Science Foundation has published a document entitled, "Science and Engineering Indicators 2008." One very interesting point for 2006, was that computer-related H-1B workers with a Bachelor’s degree, earned on average, $400.00 more per year than those with a Master’s degree. 2006, was the first year of the 20,000 visa H-1B exception for postgraduates of American colleges. The media made a big fuss about the base 65,000 visa running out quickly in 2006 and 2007. I suspect that the U.S. Chamber of Commerce had to do some arm-twisting to get the 20,000 postgraduate cap exhausted. Stuart Anderson's, National Foundation for American Policy (NFAP) study of unfilled positions is being quoted as a reason to raise the H-1B caps. I took the liberty of looking at the size of each company in the NFAP, "30 U.S. Companies With Most Job Openings For Skilled Positions."